Ron has mostly held up his end for the team but he has sure made Christina's life tough. She's worked as an ambassador/peacekeeper/social worker the whole race! And done a very nice job of it too--I like how she has mostly managed to keep smiling! Dead weight? Try just plain dead. Adam was such a baby and he hardly did anything. As far as Christina's concerned, I empathize what she's going through, but she's a bit cutthroat too. Yes, you may be on to something; while researching another project, I've come across some quotes about Christina (from other racers) that suggest she might be getting a very positive edit. I saw some of those too--but you know what? I don't mind the racers being sneaky and cutthroat--I think that is just playing the game--especially if they can get away with it! I've come across some quotes about Christina (from other racers) that suggest she might be getting a very positive edit. Really? I hope you can share some of those after the race is over. I think Christina would be a much more intersting TV character if she was shown to be cutthroat. A smiling backstabber who has to put up with her numb nut father would be great TV. Help, please. The symbol on the right is "father." I thought the one on the left might be "who," but no. It might, if it's read right►left, be Christina's Chinese name. I'm going blind searching character charts. Any ideas? Hi everyone.... yes Peaches I can read Chinese. Of course I can help. Greetings. Just read the entire thread and registered to attempt to clear the Chinese characters' meaning. Yes, those two characters means Tiger Father and I think it also means Ron was born in the year of Chinese Zodiac Tiger. It's not the Christina's name. In Chinese, there is a proverb saying that 虎毒不食子. It literally means Tigers, no matter how fierce, never eat their own cubs. No matter how much craps Ron was throwing at Christina, I think deep down inside he still loves her very much. This is my interpretation so correct me if I am wrong. Anyway, the introduction says Ron is a first-generation immigrant. Anyone knows where he is from? Based on his last name, his age and his Chinese speaking accent, my guess is that he might be from Taiwan. What you'd expect: "Tiger daughter." Maybe Tiger is pronounced "Hsu," or maybe Tiger just means...Tiger. Tiger is pronounced as "hu." From the videos at CBS.com, Ronald mentioned that his parents fled China when the Communists took over and came to the US. Has anyone heard that Christina and Azaria are dating? That was the talk at the Nate & Jen party last night. Of course, neither was there and no one had first-hand knowledge. Hendekea was very coy about it. I recall something but its been so long, really I wouldn't know where it was mentioned. Thanks. I missed that part. Ron really did change and I'm glad he didn't end up being the jerk he was acting like during the first couple of legs. Christina was an awesome racer. Willing to lie, cheat, and back stab to get a head. Hi everyone! Thanks for visiting our page. We are very grateful to have been a part of The Amazing Race 12 and feel lucky to be able to share our adventures with you. Having raced 2 legs in Burkina Faso, we have fond memories of the wonderful people in Bingo and Ouagadougou, and we'd like to give back by raising money for a local orphanage there in the village of Yako (we tried to find an orphanage in Bingo but were unsuccessful). "WHO'S YOUR DADDY?!" and "TIGER FATHER TIGER DAUGHTER" Chinese character shirts will open up for bidding this Wed, Jan 23rd. All shirts are in good condition and have been worn only around the world in Los Angeles, Ireland, Netherlands, Burkina Faso, Lithuania, Croatia, Italy, India, Japan, Taiwan and Alaska! Please take a minute to bid on one of these 7 shirts and know that your donations will be going straight to help orphans in Burkina Faso. All listings will be posted at the bottom of this page under "Item." All auctions will begin on Wed, Jan 23rd and end on Sun, Feb 2nd. Burkina Faso has one of the lowest GDP per capita incomes in the world and is the 27th poorest nation. Most children do not have access to primary education. ALL EARNINGS FROM THE AUCTION LISTINGS WILL BE DONATED TO SHELTERING WINGS ( http://www.sheltering-wings.org/). Sheltering Wings is an orphanage in Yako, Burkina Faso that has cared for over 100 orphans and continues to provide shelter and care to children who have lost their parents and have no access to primary education. It is a tax exempt charitable organization. Thanks again for watching this season of The Amazing Race and for all your support. We have grown so much closer because of the experience and are incredibly grateful to have been able to share each adventure with you! Although viewers saw it play out in only eleven weeks, Ronald and Christina Hsu's The Amazing Race journey was four years in the making. While Ron, a 58-year-old vice-president of sales from Tacoma, WA, and his daughter Christina, a 26-year-old political analyst from Washington DC, came up just short in claiming the twelfth-season title during Sunday night's finale broadcast of the CBS reality series, they still saw the adventure as worthwhile since it helped strengthen their bond. On Monday, Ron and Christina talked to Reality TV World about how they had been planning to participate in The Amazing Race for several years; how an ill-fated cab ride could have ultimately cost them $1 million; why the experience helped improve their relationship by "leaps and bounds;" and how they're planning to give back to African youth who provided them with smiles during their journey. Reality TV World: Christina, during the first leg of the race you commented how you and your dad shared a "family bond" with "Brother/Sister" team Azaria and Hendekia Azene. What did you mean by that and did it lead you two to form an alliance with each other? Christina: Azaria and Hendekea were very generous to give us some shelter in Ireland, and when I said "family bond," they're clearly brother/sister. I felt like they immediately -- just interacting with them -- that they were running the race for the adventure and for the experience and not for the $1 million, and that's what I was referring to. Ron: Also the fact that I just respected their similar values of the love of the family. Like here's a brother -- an older brother -- running with his sister who wanted to bond not just in terms of the sibling rivalry that they had, but the fact that they just loved and respected each other very much. Here we are as a father/daughter, and we just bonded immediately when we got to meet them at the L.A. airport trying to share the Internet with this person who gave us some more information... From that leg on, we basically had a good bonding relationship. Christina: We had similar styles. Like the way Azaria tried to challenge Hendekea to do her best. My dad had the same approach to me. It's a tough love relationship where you really want to just challenge your partner to do their best. Reality TV World: Donald Jerousek and Nicolas Fulks -- the "Grandfather/Grandson" team that finished third -- would presumably have the same "family bond" as you, Azaria and Hendekea, right? Christina: Yeah, they're a great, competitive team. Reality TV World: Ron you described Nick as "abrasive" and said he had "bad energy" at the airport in Dublin. What was it about Nick that rubbed you the wrong way? Ron: Well I was fatigued. I didn't get any sleep because my daughter told me not to snore when I was sharing that room with Azaria and Hendekea. Basically, there was just another issue where I asked Nick where the bathroom was so I could fill my water bottles because the Ireland tap water is potable, and he told me to go the wrong way. I just told him that, "You don't need to tell me to go in a different direction when I need to be in a different area." Anyway, it was just something that I apologized for... my outburst. Nick is a very, very intelligent young man who carried the team. He was reading the race and knows how to navigate. I don't know. He was carrying a lot of the load for that team. Reality TV World: You seemed to be having a hard time working together. Christina do you think your dad was being especially hard on you early in the race? If so, what do you think eventually brought on change? Christina: That leg -- in Durgerdam, Amsterdam, The Netherlands -- we were facing elimination; we hadn't slept for two days; we changed Detours; we were going to "Hunt It" and there were oceans and oceans of bikes. I would say that the conflict you saw between us there was really out of stress. My dad, he was just trying to help out and instill some wisdom in me. But his delivery was a type of communication that I wasn't used to and I did not like. So looking back, we are very grateful for that leg, because after that leg we had a really long talk. We talked about how we really don't want to continue on this way -- you know, arguing -- we want to improve our relationship, we want to stay in the race. We did improve from that. Although that was the depths -- that was a really tough time to go through -- we're grateful for it because I really don't think without that leg we would have gotten that far. Reality TV World: Based on that answer, I assume you did get along better as the race went on and it wasn't just editing that made it appear that way? Christina: Yeah, yeah, yeah. Totally. Definitely. Ron: I was a work in progress. By that I mean I knew I had to change dramatically if we were to stay in the race. I still had fatigue a lot -- especially with the hernia issues -- but overall I felt like I made significant strides in each leg as we went along, particularly as we got more comfortable with the way that we communicated and gave uplifting comments to each other. Reality TV World: Ron several of the other teams didn't appreciate the way you spoke to or dealt with Christina during the race. What's your response to that? Ron: They're entitled to their opinion, and I should have had a private tet-a-tet rather than these outbursts that were loud and visible. So it was not the most edifying and I do apologize to my daughter because it was embarrassing -- not just for her -- but for myself. Reality TV World: Was it especially embarrassing to see it play out when the episodes aired? What was your reaction when you watched yourself saying some of those things? Ron: (laughing) I felt very, very embarrassed for myself. Some of it was, the juxtaposition of it wasn't ideal. It was something where I gave the producers a lot of fire with my language and sort of the way that I say things because I wanted to get her street smarts as quickly as possible. So it was just trying to be all-encompassing, lecturing dad to help her so she won't repeat these mistakes. But it was something that was... The delivery was such that the message was lost. Christina: Yeah, my dad is a very passionate person, needless to say. Throughout the race -- this may have not been shown -- but we really learned from each other. I learned a lot of lessons from him. As to your question about other teams -- their opinions -- we interact only so much and overlap only so much with each team, so what they see is a very one-dimensional view. You had asked before, we certainly improved our relationship by leaps and bounds and it was definitely because of the challenges in the race and wanting to do well for each other. Reality TV World: Is that what you meant at the Finish Line Ron when you said you were a "new man?" Ron: Oh yeah. It was just a wonderful experience to bond with her, know her as an adult, not just in terms of a father/daughter relationship, but one that I can call a friend on equal status. She has great opinions and life experiences that in my eyes is superior to my ways at times. Particularly her patience and ability to be consistently uplifting in each leg. It's something that I'm very glad that she has her head screwed on right. I wasn't always there, but kudos to her way of thinking, and a lot of it also goes to my lovely wife. (laughing) I missed our anniversary, but it's something that's a great partnership that we raised a daughter like that. Reality TV World: Christina, do you agree with your dad's "new man" comments? Christina: Oh sure. I do. The transformation he did make was something that he did for me. We joke about how he's learning more of the Venus language and I'm learning more of the Mars language. I've seen not only improvements in the race, but after we've gotten back. He's really made efforts to change the way he delivers his advice, because regardless of how he delivers it, it's always well intentioned and well-meaning. He needs to change it a little to meet me halfway. I would say there is not only a visible change in how close we are and the things that I feel I can share with him now -- matters of the heart -- but there's just a sustainability. He's been my father, he's been my daddy, but now he's an extremely good friend. Reality TV World: Ron you already touched upon this a little, but you were slowed by a hernia during the race. How bad was it and did it ever really go away? Ron: It was pretty intense when I [rode the cargo bike to the second leg's Pit Stop in Durgerdam, Amsterdam]. It was something that was maybe just fatigue, but boy, when I went to the Pit Stop I had a sleepless night in Amsterdam and I asked one of the producer's assistants to basically get a doctor. They told me that they would get one, and this doctor was the one who diagnosed right away that I had this protrusion that I thought was something that was maybe a displaced kind of a wound of some sort. But he said it was a hernia, so he just asked me to lie flat on my back, and pushed it back. It was just relieved instantly when he pushed it back. Then he told me to pace my race so that I don't exert it. So I was very fortunate in Amsterdam that it was not a long leg, and then we rested on the long flight from Amsterdam to Burkina Faso. It was there in all the Africa legs, but after in Vilnius, Lithuania, it improved a lot to the point where I was able to run in sprints and rest a little bit. So I just monitored it, and by Dubrovnik I was pretty much over with it I felt. Reality TV World: Why did you decide against using the first U-Turn in Africa and the second U-Turn in India? What was your strategic approach to the U-Turns? Christina: (laughing) yeah we had a friendly rivalry with them. They're a great team! Reality TV World: Seeing as how you were the first team to arrive at the final Roadblock task, Christina do you think that you struggling with it was the reason you eventually finished the race second? Christina: So what happened, the Roadblock in Alaska -- from what I understand -- I finished about five to eight minutes after [The Amazing Race winner Rachel Rosales, who competed with her boyfriend TK Erwin]. What you did not see is that our cab driver who drove us from Goose Lake Park [the Roadblock's location] to the Captain Cook statue, he actually brought us 40 minutes out of the way. That was tough. Christina: That was a killer. At that point, it kind of just sunk in that we [had] probably just [permananently] lost our lead even though we [had already] lost it at the Roadblock. I turned the corner after I finished the Roadblock, and I didn't see TK there waiting for Rachel anymore, my heart sunk. I was just really devastated because I feel like I let our team down. But my dad was so supportive, he was so wonderful, just telling me, "Keep your chin up. Let's keep racing." It was really that cab ride unfortunately. We were so lucky and fortunate up to that point, and TK and Rachel they're very strong and lucky team, and we're very happy for them. Reality TV World: Christina, how frustrating was it to learn that Ireland was the only item you'd gotten wrong on your very first try during that Roadblock task? Christina: That was tough... That was really tough. I had it -- that was what it was -- I knew I had it. I had taken notes throughout each leg, so I was going into the Roadblock very confident and I love puzzles. I love brain teasers. So when I didn't get it on that first try, I was kind of stumped and that's when I started over thinking things. I should have just concentrated on Ireland. And so to answer your question -- sorry to be long-winded -- yes. (laughing) In a nutshell, it stung a little. Reality TV World: How far behind TK and Rachel were you in reaching the Finish Line? Reality TV World: Christina you mentioned how participating in The Amazing Race was a "dream" of yours and were glad you could share it with your dad. Was it easy to get Ron to run the race with you? Would you have done it with anybody else? Christina: I don't know if you know this, but four years ago my dad introduced the race to me. He got me hooked on Season 5. Four years ago, I wrote on the basement den whiteboard, "Amazing Race 2007," because we had always joked about going on the race. He said, "Oh, I'll only do an application if it's after you finish your master's program," and he knew I was going to graduate in 2007. So 2007 rolls around, we submit a, "Who's your daddy?" audition tape, and we put in the materials, and we get a call. Not only are we selected for the race, but we made it to the Final 3! So it really is a dream come true. When I say there's no one else in the whole entire world that I wanted to race with, it's the truth. I mean my dad introduced the race to me, this is a four-year dream in the making, and we feel just so incredibly fortunate to be chosen -- and not only participate in the race -- but to race with other, strong competitive teams. Ron: I felt that it was a lark that she wanted to get on. So I reluctantly did it. But once we got the call to get it, I was going for the gusto to run the whole race with her. We did a lot of research and having seen the previous episodes, knew where some of the pitfalls were. So I was just overjoyed that we were able to get where we were in the Final 3. Reality TV World: Christina, were you surprised that when you the ticket agent at Kansai International Airport in Japan actually seemed to listen to you when you told her to tell Nathan Hagstrom and Jennifer Parker that the flight to Taipei, Taiwan was full? Christina: ... and give us free upgrade to business. The clip where you hear me saying, "If there are any other requests, please tell them it's full." I say that immediately after we secured the last seats on that flight. So in fact, that flight was full. Immediately after we had to run and catch our flight, we didn't have time to interact with Nate and Jen, but I did explain the situation to them. I emailed them after the episode aired, and they understand. There was a misunderstanding. Also one thing to keep in mind is, anyone who knows Japan, Japan is an extremely rule-based society. They just have a lot of respect for the rules, and they would never turn down revenue. I watched the episode and I just laughed. There's just no way in Japan an employee would scheme along with me. I wish I would have those great, manipulative powers (laughing), but unfortunately I don't. So that's really what happened -- definitely a misunderstanding on Nate and Jen's part -- but I explained it to them and we're still friends. I consider them good friends. Reality TV World: You already mentioned having a knowledge of previous The Amazing Race installments. Did you do anything else to prepare yourselves both physically and mentally for the competition? Ron: Yeah, I think that we basically wanted to do basic calisthenics. So we were doing jumping-jacks (laughing with Christina). Preparing ourselves mentally, we got a list together of things we wanted to do. For instance, we knew we needed to bring gloves in case there was issues with that, and I even brought a whistle so that if I ran to a place where my voice wasn't carrying loud enough that I could... It was helpful in securing a taxi. Ron: And her language skills, we were saying that we were going to learn as much as possible and I was going to do the driving because I'm a better stick-shift driver than she is. Reality TV World: You just mentioned foreign languages, how many do you speak? I think we saw you speaking at least Japanese and Mandarin and Christina, you seemed to say at least, "Thank you," in every local language along the way. Christina: ... until we got to Burkina Faso. But what we did was... The main thing that we enjoyed about the race was making friends in different countries, so when we had down time at the airport, you can probably guess my dad, he made so many friends throughout. He just talked to people and shared stories. What we'd ask these friends to do is write survival phrases, like "Hello, thank you, faster, bathroom, please." Like in Croatia, we would ask someone to do that and then we would run around using those phrases. We really realized that just that little ounce of showing appreciation and respect for their culture through using their language, it makes someone want to help you even more. It also just opens up a window for us to understand their culture better. Reality TV World: Your CBS biographies mentioned that you've both "lived and worked abroad." How much international traveling had you each previously done? Ron: Well in my job previously, I was the export manager for an organization that I was doing extensive travel -- particularly in Asia -- so I knew that leg pretty well. Also to Mexico and some Latin America countries as well. I also have relatives in Europe, so going on vacations there with family, that was helpful. But we always tried to instill our kids to understand about other aspects and they're very fortunate to -- what some people call -- being in the United States, but "lucky sperm club," where we're so privileged to be in this wonderful country but we need to broaden our horizon with learning about other cultures. So when I had this opportunity to be stationed in Hong Kong for eight years, that gave us more of an opportunity for our two daughters to be exposed to all the different cultures around Asia. We traveled as much as possible. Christina: Right. My sister and I, we lived about seven or eight years in Hong Kong as kids. But I specifically spent one year in China, and about half-year to a year in Japan. I'm an avid backpacker. I've studied international development; I have a great respect for developing countries. So I tried to save money once in a while and go backpacking in countries such as Nepal. I've also made it to Venezuela. In terms of adapting to foreign cultures, we don't have a problem there. There isn't much culture shock. We like to dive in. Reality TV World: What was the toughest part about competing on The Amazing Race? What was you favorite part about the race? Ron: Just wonderful smiles and all that. At the end of the leg, we were sharing just our simple little things like our shampoos and our soaps and little candies that I had packed for myself. It was just wonderful to see all these kids smiling. I just felt so enthralled by their having so little, but still smiling. They were just so wonderful to us. So we basically after that -- having two consecutive legs in Burkina Faso -- Christina and I said, "Hey what can we do to give back to these lovely people?" So we basically had the support of CBS to put on the website that through ebay, we're going to auction off all our "Who's your daddy?" T-shirts. I have four of these shirts that I wore throughout the race, and they're really wonderful... All the proceeds will go to this orphanage. We're trying to find an orphanage in Bingo, but we've got this one tax-exempt organization in Yago. 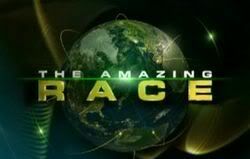 Christina: You can find all that information on The Amazing Race homepage. All the links are there. The auction opens for bidding on Wednesday and closes Sunday, February 2. One-hundred percent of earnings will go to this orphanage in Burkina Faso. Reality TV World: Okay, excellent. So assuming you couldn't have won, would you have rather seen TK and Rachel or Nick and Don win and why? Ron: I have a favorite, it would just be Azaria and Hendekia. They're the best racers. They just got this little faux pas [with] a [ticket agent] who basically gave them business class tickets. If it wasn't for that, they would have been in the Final 3. I felt that they deserved to be there because the way they ran the race, so well and smart, and just had a little problem with that ticketing agent. We just enjoyed their family values and the true nature of how wonderful they are as brother and sister. Ron: Yeah. I'm still continuing on my sales journeys and travels here in the States. Just continue on with my job here. We talk to the father-daughter team about coming in second place. BUMP because the end of the Auction is approaching! While I definitely don't want to own the T-shirts I definitely did want to make a contribution to the children of Burkina Faso! So if you are like me, you can make a contribution without making an EBay bid right HERE. Christina: Have we told you about our t-shirt auctions yet? Christina: So basically we raced two legs in Burkina Faso and my dad and I made some really good friends there. We were sitting in the airport in Ouagadougou and we had some down time and my dad turned to me and said, "You know we should really do something -- we should auction off our "Who's Your Daddy?" and "Tiger Father, Tiger Daughter" t-shirts and donate the earnings to a charity. When we got back from the race, we did some research, and we decided upon this one orphanage in Burkina Faso. So if you go to the homepage of The Amazing Race and also the CBS.com homepage, they have a link to our eBay auction. All auctions start Wednesday [Jan. 23] and end on February 2. They're for my dad's "Who's Your Daddy?" shirt and both my "Tiger Father, Tiger Daughter" Chinese character shirts will be auctioned off and all the earnings will go to an orphanage in Burkina Faso. We promise we've washed all the shirts (laughs) and just hope that a lot of people will participate. That's a very nice sentiment on Ron's part.